The two Chinese zodiac signs of the rat and the rooster could be capable of forming a connection. Can the Rat and Rooster form a long lasting relationship? Will their differences bring them together? Or will their differences cause them more issues? What does Chinese horoscope compatibility have to say about this love match? The rat will be shrewd and clever. They can be schemers and also somewhat of sly thinkers. They are free and somewhat artistic and the rooster might not like this. The Chinese rooster animal sign is a perfectionist who is blunt and honest. Because of this, the rat could fail to meet their partner’s higher standards. They are rational and prefer conservative and proven paths in life. There is very good potential initially in a Rat and Rooster friendship. The rat and the rooster will have to learn and understand where each one finds their motivations. The rat is able to be reserved and will always treat those they care about very well. The rat and rooster dates will be fun as both will like going out somewhere with friends a lot. The rooster can be a completely devoted, faithful partner. A rat and rooster in love will be able to have fun with each other in a romantic relationship. In bed, sexually the Rat and Rooster will be intimate initially. The rooster will lack a good reason for complaint when it comes to how the rat treats them in a romantic relationship. They are a little arrogant and requires flattery and compliments. The rat will have no issues giving the rooster what they require. Troubles in the Rat and Rooster relationship starts when the rooster starts insisting the rat conform to their expectations and be more serious. Even though the rat is friendly, sociable, and loves a good time, they are not frivolous. 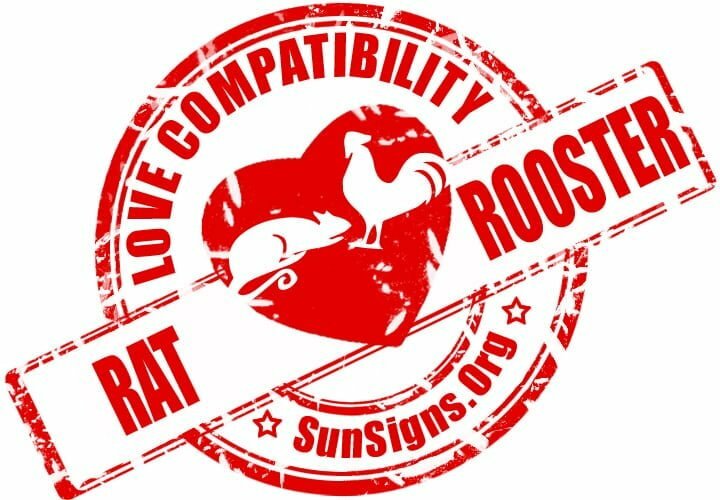 The rat rooster love compatibility is not too great. The rat is frugal and will not appreciate the rooster being critical. Both the Chinese astrology signs are domineering and self sufficient. They both will try to dominate everything they can. As a Chinese zodiac sign, roosters are analytical and original and enjoy objective things. They will think the rat is not being grateful. They lack flexibility and tend to be authoritative. The rat female can be annoyed by this. The rats will be very smart and because they are more independent they are not likely to listen to the rooster female. The rat man can feel inferior to the rooster woman and vice-versa. The rooster man tends to be egotistical and vain. The rat woman will want a partner who is loving, comforting, and kind. The rooster male is not going to be likely to be capable of provide the rat with this. The rat and rooster breakup will eventually happen as both will have issues trying to make this relationship successful. Both the rat and rooster can become soulmates and will be more likely to be happy together if they are both more mature. If the rat and the rooster both become more mature, they are likely to be able to have more patience with one another. If the rat and rooster compatibility is to survive, they will need to have more patience with one another. It will then be easier for the rat to tolerate the rooster’s criticisms. Rat & Rooster Chinese Horoscope Compatibility Rated 2 Hearts!